This can be one or several trees planted directly on a rock, which then acts as the pot. 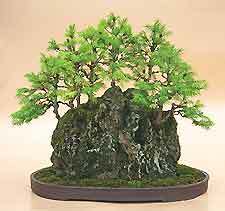 In order for this procedure to be carried out the rock must contain a crevice or pocket large enough to retain the soil and roots of the bonsai. 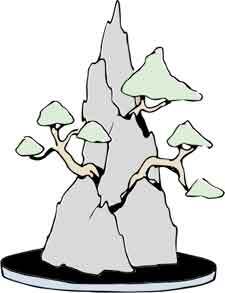 The trees can be grown on the top or side of the rock depending on where the rock has the best planting positions. The arrangement is best displayed in shallow pots with no drainage holes (suibans), filled with water. By using interesting rocks, it is possible to achieve a realistic scene of trees growing naturally on the top or sides of a sheer cliff or mountain.